The chain have been present on south Dublin’s main shopping stretch for over 20 years. NEXT, THE UK fashion and home living retailer, is set to close its store on Dublin’s main shopping street. The chain have been present on Dublin’s Grafton Street for over 20 years. A report in the Irish Times suggests that the firm is looking to move away from Dublin’s heavily-exaggerated high street rental prices towards larger, more spacious standalone stores. The shop space will apparently be taken over by perfume and fashion giant Hugo Boss, which is expanding its store network rapidly since removing the majority of franchises from its brand. TheJournal.ie contacted Next regarding what plans the retailer has for the central Dublin outlet, and as to whether or not the shop’s closure will involve redundancies. While confirming that a closure is imminent, a spokesman for the store told us that the specifics of the deal are not yet known. “At present we are still finalising a lot of the details relating to the below, so are not yet in a position to comment,” they said. Currently the rent on the retail space is €825,000 per year. It’s likely that the move will precipitate Next moving to a larger retail space. Most of their stores in the Dublin area are now based in larger out-of-town shopping centres such as at Dundrum and Blanchardstown, with their Henry Street store set to be their only base within the city centre going forward. Email “It looks like Next are set to close their flagship Dublin store”. 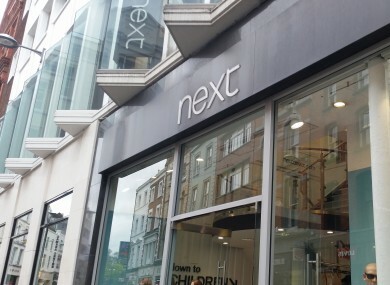 Feedback on “It looks like Next are set to close their flagship Dublin store”.